After 21 weeks, I'm not sure that this series needs any further introduction for you all! I will say, though, that as midseason finales are approaching (seriously HOW IS IT ALREADY TIME FOR MIDSEASON FINALES?! ), the stakes are being consistently upped in the shows that we are watching. Secrets are unraveling, plans are being revealed, and spin-offs are being set up. With midseason finales lurking around the corner, our performers are bringing out some of their most emotional work, laying the groundwork for what is to come in the next few weeks. Why she's the MVP: In spite of the fact that The Blacklist has hit a bit of a rough patch in the past few episodes in terms of storytelling, this week's episode provided me with one, unquestionable standout — Mozhan Marnò. I've always found Samar to be a really interesting character on The Blacklist. She often comes across as detached and precise. In the saga this season regarding Liz on the run, she has been the only member of the team to actively question Liz's motivations and innocence. While Ressler's feelings toward Liz and Aram's friendship with her have clouded their judgement in a lot of ways, Samar hasn't had that problem. But in this week's episode, we had the chance to see Samar's backstory — and it was absolutely wonderful and heartbreaking, as the past bled into the present-day in a significant way. Samar's brother, whom she once presumed to be dead, shows up when the FBI raids a warehouse where a suspected terrorist is operating. ... Except then Samar realizes that her beloved little brother — the boy she vowed to protect — is the terrorist himself. The anguish and shock during her discovery of this, coupled with her fear and disgust over watching him and the other terrorists slaughter innocent people is powerful. But what really stands out to me and what makes Mozhan so MVP-worthy this week is the moment that she makes the decision to hand her brother over to Red. As I mentioned above, we don't often see Samar emotional. We see her more rational and logical, but this episode — and this scene, really — we get the chance to experience all of the pain that Samar has carried around with her throughout most of her life. Mozhan Marnò absolutely nails every single emotional beat in this episode. In the course of one episode, she is asked to be flirtatious, relieved, terrified, brave, anguished, exhausted, and many more different emotions. And I think that what truly struck me about her performance this week was how raw and vulnerable it felt. I was so used to seeing Samar as this stoic, heroic figure that watching her break down in the office and lean against the doorframe at the end of the episode felt intensely personal and emotional to me, almost as if I should be looking away because the moment was so private. 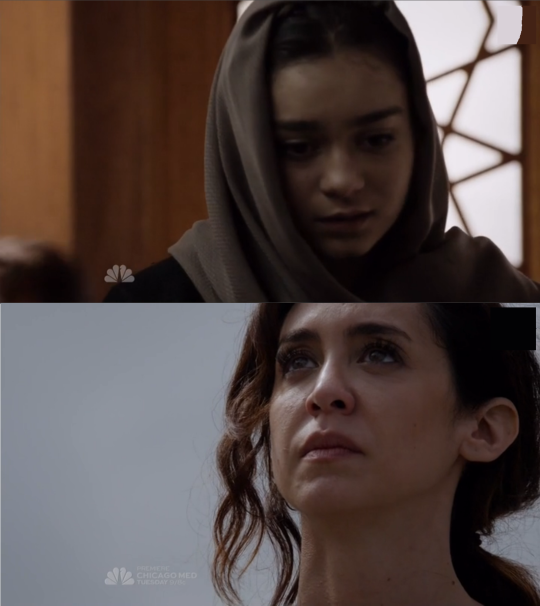 I love that The Blacklist took this episode to explore her character and cannot praise Mozhan enough for making Samar so wonderfully nuanced in her grief (I got choked up when she turned away from her brother and said that, to her, he died years ago in the bombing) and her portrayal. Why she's the MVP: If you’re asking why I chose Jennifer Morrison as my MVP, then you haven’t been watching season five of Once Upon A Time. It’s rare than an actor gets to play a completely different side to a character five years into a show, and yet that’s exactly what Jennifer has gotten to do thanks to this Dark Swan story arc. And, if it just were her playing the villain, that would not be noteworthy. Bad guys are everywhere in media, and good actors who play bad guys are not that rare either. But to be able show vulnerability while playing a dark character — to show pain and love and fear and anger while still maintaining the facade of control, and more importantly, to make us see the struggle, physically, on screen... that’s not only more than we usually get, that’s more than any of us had a right to expect. This is not the first time Jennifer Morrison has made stop and go marvel at her excellence. To me, she’s always been an exceptional actress — I’ve loved her since House. But I never really understood her range, her capability for transmitting raw emotion until I saw her as the Dark Swan. In last week’s episode she gets what, to me, is the moment of the week. With the fight to remain Emma clear on her face, she tells Nimue that she doesn’t need the power of the Dark One to feel purpose and to feel complete — to be something. She’s not nothing; she never has been. It’s the rallying cry for anyone who’s ever been misunderstood or pushed aside — it’s Emma saying "I’m enough, I’m worthy, I’m good." And if the moment feels universal, the sentiment something all of us can relate to, it’s because of Jennifer’s outstanding performance. She might be the Dark Swan, but she’s also Emma. And thanks to Jennifer, we love them both. Why he’s the MVP: Surprise! Mer chose someone from Arrow as MVP this week. I know everyone is totally shocked, right? To be honest, I could have chosen one of four amazing Arrow actors this week, as along with Stephen Amell, Emily Bett Rickards, Charlotte Ross, and David Ramsey all delivered stellar performances. But as much as I love them all, Amell really shone this week. This episode was much more of a character and relationship study than it was an action-packed one — although the action sequences it did have were impressive — but the true crux of the episode was an examination of Felicity’s (Rickards) character, and by extension, her relationship with Amell’s Oliver. Amell does action well. He has a physicality to him that translates into believability on screen during fights and stunts sequences, but when he really gets to show off his acting chops and when he gets to play alongside other strong actors that get at the heart of who his character is, he’s never better. It’s been said in the MVP series time and time again, but it’s worth repeating: Amell and Rickards are perfection when together on screen. Every interaction they have is laced with chemistry, an understanding, and a connection. They understand their characters along with each other’s characters, and there is a mutual respect there that is obvious. So this week, it made sense that we saw Oliver play the supportive but concerned boyfriend — a man worried about his relationship as he realizes that for the first time ever he is the one more ready for commitment. Amell played his part expertly. With just a look in his eyes, or a quirk of his lips, or a tilt of his head, he conveyed every emotion Oliver was feeling — fear, sadness, worry, understanding, love. He didn’t even need words, though he delivered those perfectly as well. Despite the strength and emotion of all of many of Amell's scenes, none of them are my pick for his best scene this week — the conversation between Oliver and Diggle in the lair, after Felicity reveals her fears over losing herself to Oliver. Amell and Ramsey have an ease and naturalness to their interactions that speak to their offscreen friendship and mutual affection, and it’s to the writers’ credit that they quickly wrapped up their characters’ conflict so as to get back to this easy camaraderie. This brief scene where the men share a drink is as important as it is genuine. Dig talks sense into his friend, as only he can. Because Oliver was upset, worried, and feeling insecure, so he went to the one place and one person that he knew would understand the situation. Amell’s intuitiveness into Oliver’s psyche was never more apparent than this scene, where he explained that he isn’t jealous of Ray, but rather disbelieving that such an amazing woman chose him. It speaks to four seasons of Oliver’s self-doubt and lack of self-worth, all coming out as he finds himself, for the first time, in a relationship that he wants to last forever. Even at the end of the episode, when the couple makes up, these lingering doubts are clear on Amell’s face and in his tone. It takes the one-two punch of the conversation with Diggle and the end scene with Felicity to start to alleviate his concerns, and Amell plays it all brilliantly. Though Amell does a truly commendable job of carrying the show week after week, the scenes and episodes that allow him to show his deep understanding of his character, as well as the characters with whom he interacts, really showcase his talent. This week provided that in spades, and Amell rose to the challenge. Why she’s the MVP: Do you want to know how strongly I feel that Emily Bett Rickards was the absolute reigning-above-all MVP of television this week? I literally stayed up until 5:07 AM on Friday morning so I would be the first one to answer Jenn’s email to claim her for this week’s post. (This is what it takes to beat Mer.) Trust me when I say going into a 12-hour workday with three hours of sleep was absolutely worth it because EBR is queen of everything and I have a lot of feelings. Anyone who knows me well knows that I strongly identify with Felicity Smoak. In all my years of being obsessed with television, I have never come across a character that is so much like me. I love her dearly and revel in any chance I get to learn more about this beautiful, strong, amazing character. Felicity was put through the ringer this week, and the audience got to see a more frazzled, distressed, and overwhelmed side to her. There are some who claim whenever Felicity Smoak steps out of her “quirky nerd” or “romantic love interest” box they have put her in that she is out of character. While I have some words for those people that Jenn doesn’t allow us to use on this site, I believe that EBR’s performance in this episode shuts down any such nonsensical arguments completely. While adding new colors to the palette in the exquisite portrait of her character, Rickards managed to still make it genuine and completely “Felicity.” As we witness by her ponytail not being perfectly smooth, Felicity Smoak is in crisis mode. She is stressed, tired, and livid, which makes her responses different than the calm Smoak we usually see. Rickards was able to take the determination, efficiency, and independent spirit we have seen in Felicity Smoak before and translate it into portraying her as frustrated, frantic, guarded and independent. Independence makes it incredibly difficult to let others in and rely on them. In EBR’s performance, you essentially see Felicity do the emotional equivalent of slamming on the brakes at the realization at how much of herself she has given to Oliver. She is terrified, but outwardly covers it with frustration and a sharp tongue. Using the strength gained from working with actors with whom she has such earnest and magical chemistry, Rickards was able to really dig deep emotionally this episode. The scene in which Felicity revealed her insecurities to Oliver was gut-wrenching. The vulnerability she exuded during her scenes with just Stephen Amell, as well as Charlotte Ross, moved me to tears. We got a revelation of Felicity’s soul and how much she is growing as a woman in one of the healthiest and beautiful relationships currently on television. The emotional payoff — as Felicity realized the strength that comes from letting someone in — was exquisite. In a sweet and captivating scene with Charlotte Ross, you see Mama Smoak’s words sink in on Felicity’s face and, without speaking a word, EBR is able to soften. Thus in the final scene with Stephen, Felicity’s light has returned. We see this renewed confidence and love in her movements and hear it in her voice. Emily Bett Rickard’s ability to play such strong emotions with such a gentility and ease is unparalleled. The soft smile filled with love as she reassures Oliver in her belief in their relationship is everything. Overall, this episode really allowed Emily Bett Rickards to shine to the full potential of her radiance and it was a joy and a compelling journey to take part in. EBR is our leading lady and her absolute talent, emotional depth, loving spirit and charisma are the definition of “real girl power” and the reason why she is unequivocally this week’s TV MVP. Why he’s the MVP: Ever since returning last month, The Flash has been moving full steam ahead, completely embracing its comic book roots with the introduction of the multiverse theory, specifically Earth-2. We’ve witnessed the return of Dr. Harrison Wells over the past two weeks — albeit the Earth-2 version of him, played with a mix of quiet fury and trepidation by Tom Cavanagh. What has been so great about Cavanagh’s performance is that he essentially gets to reinvent a new character that we’re already familiar with. Rather than make Wells menacing and evil again, Cavanagh conveys him as prideful, and, later, remorseful. We learn Wells did create the metahumans on Earth-2, but rather than keep that a secret, he designs anti-metahuman technology to profit from their existence. It is interesting to see Wells as more of a pioneer, someone who we would have anticipated had he had lived on Earth-1. Cavanagh brilliantly portrays this greed in the beginning, with a façade that he believes he’s one of the world’s biggest pioneers. However, Cavanagh once again shows how adept he is at portraying the different layers of Wells. While at first “Harry” appears abrasive and prideful, we see on Earth-1 that he’s more distrusting and remorseful. Harry, we learn, had a hand in creating Zoom — the unstoppable menace who has since kidnapped Harry’s daughter. Here, we feel sympathy for Wells, if only because now we see him as a father simply trying to save his daughter. Cavanagh does an excellent job at conveying Wells’ desperation in these moments and making that desperation relatable. In some of this week's lighter moments, Wells becomes annoyed by Cisco’s awkwardness. But we get to the big reason why I picked Cavanagh as MVP — after insisting on immediately going after Zoom, Wells becomes anguished when the plan does not work. He then lets out a tortured scream and soon reveals why he wants Zoom so badly. In this moment, Cavanagh shines as Wells. All the torture, anxiety, and desperation he feels at fixing his mistake and reuniting his family is poured out in this small moment. Cavanagh quietly builds the anger and frustration, then unleashes it in this small but powerful burst. It’ll be interesting to see what layers he will reveal for the rest of the season. Why he's the MVP: You guys might know by now that the TV MVP series has turned into a competitive sport around here. So as I watched this week’s stellar episode of The Flash (seriously, they went all out for this one), I was also actively on the hunt for my MVP candidate. Although the whole cast did wonderfully, Valdes really shone this week. The ups and downs of this episode — from far too many one-liners to list here, to the whole iffy Wells thing, to the intense last act — were extensive. I’m in no way surprised by this range — this is a show with a wonderful sense of humor and a good dose of high-stakes drama. The cast of actors are remarkably talented at bringing humor to any scene in a subtle, natural way, all while keeping the dialogue grounded. However, hands down, Cisco had some of the best lines of the whole episode. And while the lines themselves are funny on paper, the brilliance of these lines stems from the delivery of Valdes, who can take a simple line such as “Whatever, Harry” or “Yeah, SAW THAT” and present them in such a way that makes you want to pause the TV so you can laugh and take in the glorious humor without missing anything else. The scenes between Earth-2 Wells and Cisco were just the right amount of tense, and the somber tone of Cisco and Caitlin at Star Labs in the last act made the whole thing heart-wrenching and believable (obviously we’re not going to lose Barry to Zoom). Valdes managed to balance these heavier moments out with the cardboard cutouts training scene, which was light and fun. Now that Cisco has powers, I have a feeling he’s going to move even more into center stage of the show, and I can’t wait. The bottom line is that Valdes simply IS Cisco. It’s beyond comprehension that someone else could have played this character and played him right. He knows just when Cisco should be joking about something and when he should say something with complete seriousness. That’s what makes this character so nuanced and human. Cisco is a combination of many things — he’s not only the most comedic, excitable, positive character of Team Flash, but he also keeps the show grounded through courage, loyalty, and a good amount of sarcasm. There’s a scene in this episode where Caitlin is ranting and mentions a hypothetical villain named Sergeant Slow, who would hypothetically wreak havoc on Central City. Cisco, leaning back in his chair and with completely blasé seriousness replies: “I would never let that happen. Sergeant Slow is a terrible name.” It’s little moments like this that make The Flash what it is, and when Cisco is given such moments, Valdes conveys them perfectly. Why she's the MVP: Before the episode even aired, Arrow’s “Lost Souls” created a both a collective sigh of relief and cries of joy from fans. Mama Smoak would be here. We knew everything would be wonderful... and everything would be fine. Playing fan favorite Felicity Smoak’s mother is no easy task. Fans are equally as passionate about Felicity as they are protective. With each episode in which she is featured, Charlotte Ross rises to that challenge, but “Lost Souls” is her strongest performance to date. Donna Smoak bursts on screen in her trademark tight dress and shrieks of joy as soon as she lays eyes on on Felicity. Her daughter’s shock is understandable because it isn’t Felicity who invited her mother to town, but boyfriend Oliver. Mama Smoak arrives just in time to see Felicity’s meltdown over her relationship with Oliver. And Felicity’s fierce independence and fear of abandonment finally come to a head as her relationship with Oliver cements in commitment. In a deeply powerful performance, Charlotte Ross captures Donna’s unconditional love for Felicity — the mother guiding her daughter through uncharted romantic territory. As she reflects on her life with Felicity’s father — the man who abandoned them both — Ross uses the dialogue in the scene to tenderly unearth the hurt, betrayal and pain Donna carries. And yet... Donna Smoak is not jaded. She can recognize that Oliver is nothing like Felicity’s father. With a breaking voice — one equally wistful as it is grateful — Donna tells Felicity she doesn’t have to be afraid. She can love Oliver. In this moment, Donna gives her daughter the freedom to lose herself in that love without fear. She can see further down the line than Felicity and knows, in the end, her daughter is truly found with Oliver. It is quite simply a stunning performance. Ross portrays Donna’s desire for a better life for her child in every gesture and word. In short, Charlotte Ross captured the essence of motherhood in a single performance. On the surface, Donna and Felicity are nothing alike, but the magic Ross brings to Donna Smoak is by playing the humor in their differences and finding the heartfelt emotion in their similarities. The reason the audience has fallen in love with Donna Smoak is because Ross found the heart of a Smoak woman — a deeply kind, compassionate, brave, and wise person who loves with her whole self. Thanks to Charlotte Ross’ performance, the audience knows Felicity Smoak is truly her mother’s daughter. Why she’s the MVP: Last week was a bit of a doozy for those in the know at French court. King Francis’s health has been in rapid decline and it was a struggle to keep his condition from getting out. Mary, knowing her duties as a queen, was stoic and kept it together until the very end. But it wasn’t his end. The healer Delphine saves the day and rescued him from his fate. With Francis now alive and seemingly well, Mary is happy and hopeful for their future. She looks forward to a long life with her husband. Since the stress of Francis’s health no longer an issue, Mary is able to sign a peace treaty with her cousin and enemy, Queen Elizabeth, and forfeit her claim to the Scottish throne. Her life is finally in a good place and she can be at peace. However, unbeknownst to Mary, Nostradamus has told Catherine that his visions of Francis’s fate still haunt his dreams. Catherine tells Francis, but they decide not to tell and worry Mary. Francis instead takes Mary to Paris to do what he wished they could have done before his illness intensified. All the while, Mary is blissfully unaware of the cloud still hanging over her husband’s head. She’s happy for the first time in a while and is practically glowing. As they’re on their way to Paris, she asks the driver to stop and says they should go for a swim alone in the lake. Francis agrees and they have a wonderful private time together. She dresses and informs him that she’s going to ready the guards. It’s not long before she runs into a group of men who were sent to kill her. She’s scared and doesn’t see a way out of the situation. Francis comes to her rescue, and only too late realizes the tree Nostradamus foresees him dying under is there. He fights the outlaws before the guards can arrive. One slams his head into the ground three times as Mary watches and screams. It’s a pain that you can hear — a pain that you know is full of terror for her husband. The assassins have all died and, as Mary turns to Francis, he stands still and quickly collapses. She races over to him, full of dread. They had gone through so much and now he’s to be taken from her again. She wails for the guards to run for help, but there’s no use. She knows that this is Francis’s fate, that he will die here. She sobs and says that she will never love another the way that she loved him. Catherine and Bash arrive to a very lost Mary. Catherine asks her to let go of Francis and grab hold of her instead. It’s then that Mary realizes what has truly happened and starts to wail. She arrives back at the castle in a fit of sorrow and rage. She races through the throne room screaming and ripping down flags. Her whole life has been dismantled, only when it had finally gotten better. She runs from the throne room into the English ambassador’s chambers and demands to know why Elizabeth sent those assassins. She cannot believe her cousin would stoop so low when they had signed a peace treaty. Mary refuses to hear what the man has to say. Distraught and unable to see beyond what she believes, Mary throws the peace treaty into the fire without hesitation. As the funeral begins, Narcisse tells her that they caught the one who ran and it was actually Scottish rebels who attacked them. She cannot believe that the Englishman was telling the truth, but immediately gives the order for the remaining assassin to be hanged. When the guard tells her it’s customary for the Queen of France to ride in the first carriage, she reminds them that she is no longer their queen and proceeds to walk behind the casket. The entire situation has turned her cold and empty. What Adelaide Kane did so brilliantly in this episode is go from an optimist who stares brightly into the future and full of love to someone scared and not only heartbroken, but shattered and full of sorrow, to someone who is hard and staring into an uncertain future. She ran from one end of the spectrum to the other all within the course of one episode and was believable from start to finish. I was in tears by the time she was screaming in the forest and cried alongside until the very end. She did a beautiful job and it will be interesting to see where she goes from here — as both an actress and a character. Long live the King, my friends. I can’t help but love Toby Regbo and all that he has given to this season of the show. He was never particularly my favorite in the beginning, but he’s been so amazing and has played this arc and character so well. I thought that Regbo was truly special and gave so much emotional depth when it was necessary. He was soft and kind and had no regret. I absolutely loved Francis, and even though I can read a Wikipedia article and know he, as a character, was doomed from the beginning, I will still miss him.